On 15 November, Belarusian Defence Minister Andrej Raŭkoŭ appeared on Belarusian Television to discuss a new military doctrine, which he attributed to the arms buildup in neighbouring NATO states surrounding Belarus. The series of exercises with the Russian Army that began with ZAPAD 2009, were in anticipation of a NATO threat to the territory of Russia and Belarus that would require a military response. Specifically, the Russia-Belarus operation targeted Poland and Lithuania, and Russian missile carriers TU-95 and TU-160 bombed mock objects in those countries. Such an approach anticipated the close cooperation of the two armies against the common enemy of NATO. Essentially that approach did not change drastically in the current year, as a joint exercise named “Union Shield 2015” in Kaliningrad in September preceded training sessions with the rapid response forces of the Collective Security Treaty Organisation in Tajikistan. Another link is that one of the leading figures on military decisions, Stanislaŭ Zaś, confirmed as Secretary of the Security Council of Belarus on 5 November (earlier he served four months as Acting Secretary), holds the rank of Professor at the Russian Academy of Military Sciences. Yet the pursuit of a common military doctrine with Russia has become a liability to the Belarusian government. At a mundane level, the two armies remain vastly different, not least in salary. Whereas a Russian captain can expect to receive a monthly salary of just over $2,000, his Belarusian counterpart brings home a salary of less than $150 — following a rise in salary from around $100. But more important the goals of the two states are no longer in harmony. Belarus fears becoming embroiled in a hybrid war, particularly on its southern border with Ukraine. The Russian invasion and occupation of Crimea in February-March 2014 marked the decisive turning point in Lukashenka’s decision to introduce a new military doctrine. In theory, Belarus possessed ample weaponry after its declaration of independence in August 1991. As military expert Aliaksandr Alesin has noted: “We don’t have many troops but we have a lot of weapons,” most of which were inherited from the former USSR. In the number of tanks, armoured vehicles and guns per 1,000 troops, Belarus currently ranks first in Europe. But in July 2012 it suffered the embarrassment of the intrusion of its airspace by planes from Lithuania piloted by Swedes, which dropped teddy bears bearing pro-democracy messages over Minsk and other areas, including directly over the residence of the president. Understandably the Belarusian authorities reacted furiously, but more important, the event served as a psychological blow to the president and sparked fears—largely unjustified—that Belarus appeared vulnerable to an attack from the air. Following his reelection, the president held three meetings with military leaders on 30 October, 3 November, and 6 November 2015. The third was largely ceremonial coming during Lukashenka’s inauguration ceremony as troops swore the oath of loyalty to the president and country. On 30 October, Lukashenka reported that a new military doctrine would be introduced in 2016. It would entail a gradual reduction of the size of the regular army from 250,000 to 65,000, along with the restructuring of administrative and support personnel. On 3 November, while visiting an electro-mechanical factory in Dzerzhinsk, the president announced the task of introducing a new generation of modern rocketry. This latter revelation requires some explanatory background. Its origins lie not in military links with Russia, but with China. Belarus has created a new rocket complex called “Polonez” (Polonaise), a means to inflict “unacceptable damage” on an attacking enemy. The rockets in question have a range of 200 kilometres (about 120 miles), meaning that they could strike the capitals of all neighbouring states, though they could not reach Moscow. Within range would be military objects of NATO countries: the Baltic States and Poland. China, which produces the missiles, financed the project whereas Belarus’ role is to manufacture the trucks and missile launchers. Interestingly, however, Belarus will produce and control the missile targeting system. In this way, Belarus has bypassed Russia, which had expressed scepticism about the ability of the smaller state to produce such advanced weaponry. The Polonaise’ local base is the Minsk Wheel Tractor Plant MZKT 7390 “Astrology,” and the rockets could deliver a simultaneous strike on eight targets at the 200 kilometre range. In addition Belarus also intends to produce its own drones, the formation of its own rapid respond force—in addition to that of the CSTO—and the formation of an army of local self-defence. 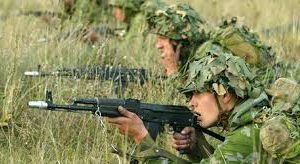 In all aspects the doctrine emphasises a form of aggressive defence and even a preemptive attack on an enemy about to strike Belarusian territory. In addition to the new concept, the full details of which are unknown outside presidential circles, Belarus must re-equip its existing weaponry though it lacks the finances to do so. Reliance on Russia to subsidise and replenish the Belarusian military fleet backfired when Russia opted to construct its own air base near Babruisk. The establishment of the new military doctrine runs counter to Russian plans and also appears to undermine CSTO unity because the course being pursued by Lukashenka is one of neutrality, especially in the conflict between its two neighbours Russia and Ukraine. Yet the fundamental alliance between Belarus and Russia remains and military exercises continue. Thus the limits of Belarus’ military independence appear obvious. Lukashenka seeks a national deterrent free from Russian control. Simultaneously his country remains an integral part of Russian strategic space and needs Russian help for its homeland defence. Lastly, Belarus remains in the Russian-dominated alliance CSTO, as well as the Russia-Belarus Union. The economy of Belarus shows a long-term negative trend. The need for structural reforms looks obvious even within the elite, and this need for structural reforms is desired especially by international creditors. In the political and military realm, Minsk struggles with Russia’s attempts to influence it. As Alieś Aliachnovič shows in his piece, the authorities are not ready for large-scale market reforms, but rather slow and partial structural reforms appear inevitable. This is because creditors will monitor the progress of reforms before agreeing to pay the next tranche of funds. Igar Gubarevich analyses the acceleration of Belarus-US contacts and concludes that the United States no longer regards Lukashenka as a Russian puppet. In order to contain Russia’s growing assertiveness in the region and beyond, the United States may help Lukashenka reduce economic dependence on Russia by assisting with securing an IMF loan and facilitating more trade and investment. Siarhei Bohdan argues that the Kremlin is pushing for an airbase in Belarus for political, not military reasons. It seeks to eliminate any vestiges of Belarusian neutrality, which Minsk had built up in the past decade, by distancing itself from numerous Russian policies and looking for alternative partners. The Ostrogorski Centre has published its annual report highlighting the main achievements in 2015 and its plans for the future. In 2015, the centre expanded its leadership team and established new partnerships. The Centre launched BelarusPolicy.com, a research database in cooperation with the Belarus Research Council and expanded BelarusProfile.com. It is about to release the 2015 issue of the Journal of Belarusian Studies. Analysts at the Centre organised and participated in several Belarus related events in Minsk, Vilnius, London, Berlin and other place. This helped the centre increase its presence in Belarusian and foreign media. The report describes this in detail, with pictures and charts. Over the next two weeks, the Centre plans to launch a fundraising campaign to support Belarus Digest and its other projects. Yarik Kryvoi in an interview for the Belarusian service of Radio Liberty comments on the recent warming in Belarus–EU relations and the EU’s apparent shift of focus from democracy to the security agenda. He also touched upon the redlines which Minsk does not want to cross in its relations with Russia. Polish Radio talks to Igar Gubarevich about the Belarusian authorities latest steps in expanding the countries’ exports to traditional and new markets. Minsk tries to boost trade with a wide range of countries, but its efforts may not prove effective because of administrative methods and the kinds of produce that Minsk tries to sell. Siarhei Bohdan comments to Polish Radio about recent trends in Belarus’ security situation. After the change in the wider-region’s security situation Minsk has started to distance itself from Moscow and seek partners in other parts of the world. Besides, Belarus gives more attention to its army and develops its own weapons instead of buying Russian ones. Igar Gubarevich talks to Belarusian Radio Racja about Belarus’ chances of profiting from the suspension of air traffic between Ukraine and Russia and possible Russian pressure. Belarus has enough capacity to connect Russia and Ukraine, and will not stop benefiting even if Russia were to desire such an outcome. Siarhei Bohdan discusses in RFE/RL’s Belarusian Service programme the recent developments in Syria’s civil war and Minsk’s policy in the region. Belarus has for a long time taken the approach of its US allies in the Syrian conflict, and reacted very cautiously to Russian-Turkey tensions over a downed jet. Importantly, the Russian South Stream pipeline project involving Turkey now seems unrealistic, and Belarus may become the host for another pipeline to Europe. The BelarusProfile.com database now includes the following personalities: Dzmitryj​ Kruty, Aliaksandr​Zabaroŭski, Dzmitry Babicki, Elena Korosteleva, Andrej Jelisiejeŭ, Lieanid Zaika, Andrej Laŭruchin, Anatoĺ Michajlaŭ, Mikita Bialiajeŭ, Vadzim Smok. We have also updated the profiles of Taras​ Nadoĺny, Aliaksandr ​Lukashenka, Michail Orda, Aliena Kupčyna, Juryj Čyž, Aliaksiej Vahanaŭ, Ina Miadzviedzieva, Piotr Mamanovič, Stanislaŭ Zaś, Andrej Raŭkoŭ, Siarhiej Kaliakin, Iryna Kanhro, Anatoĺ Kapski, Viktar Karankievič, Dzmitry Kaciarynič, Tadevuš Kandrusievič, Uladzimir Kanaplioŭ, Natallia Kačanava, Aliaksandr Kaškievič, Vitaĺ Voŭk. Strategic Thought team. Recommendations to the program of the socio-economic development of Homieĺ region in 2016-2020. Strategic Thought, 2015. Uladzimir Akulich, Uladzimir Valetka, Sierž Naŭrodski, Anastasija Charnushevich, Darya Sushkevich. The second issue of Macroeconomic Review of Belarus in graphs (January-June 2015). CASE Belarus, 2015. Uladzimir Akulich, Uladzimir Valetka, Sierž Naŭrodski, Anastasija Charnushevich, Julija Trus. The third issue of Macroeconomic Review of Belarus in graphs (January-September 2015). CASE Belarus, 2015. 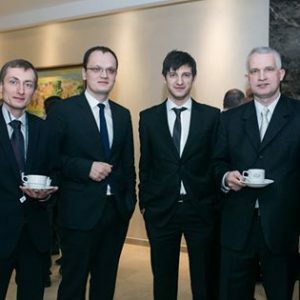 Aleksander Avtushko-Sikorskiy, Vladimir Artyugin, Aliaksei Lashuk, Dzianis Melyantsou, Jury Chavusau. Semi-annual monitoring of the main trends BISS-Trends (January – June 2014). BISS. Belarusian Institute for Strategic Studies, 2014. Aleksander Avtushko-Sikorskiy, Vladimir Artyugin, Aliaksei Lashuk, Dzianis Melyantsou, Jury Chavusau. Semi-annual monitoring of the main trends BISS-Trends (July – December 2014). BISS. Belarusian Institute for Strategic Studies, 2015. Follow all the news from the Ostrogorski Centre on Facebook.